The Bel-Air College of Nursing is very popular because it s probably only one of its kind. This is one college that is supported by the University of Illinois at Chicago. The college building has a large area of 18164 Sq Ft. The college is also well furnished with excellent infrastructure. Good labs and hospital attachments help in providing the best education for budding nurses. The Bel-Air hospital was founded in 1912 by Dr. Rustomji Billimoria, though the control of the hospital has been transferred to be under Indian Red Cross. a) not less than 17 years as by last day of the year of admission. Applications for the course can be obtained by paying a Demand draft to the college. The cost of application form and prospectus is Rs.300 and it has to be paid in person to obtain the application form. The Higher secondary marks of the candidates are used for preliminary selection of candidates. Those with higher marks in their 12th standard and the entrance exams are called for an interview. The interview conducted by the selection committee is used for the selection process. The final selection will be based on the performance in the entrance test, interview, physical check-up and H.S.C marks. The selection of all the candidates is based on a written test and an interview. The written test comprises only of multiple choice Questions. The questions will be based on the qualifying exam. For example, for BSc(N) courses, the questions will be from the 12th standard Physics/Chemistry/Biology/ General knowledge/ English subjects. The institution has a regular tie up with Bank of Maharashtra and students can avail more than 4 Lakhs educational loan. The students who want to make use of the facility have to submit documents to the officers of the Bank on the day of admission. Various kinds of scholarships are available for students good in academics. Students from the minority communities can avail scholarship of about Rs. 32,000/- each year. Students from reserved categories like SC/ST/NT are eligible to get scholarship of Rs 60,000/- each year. This scholarship is from the Department of Social Welfare, Government of Maharashtra. Other scholarships are from the Indian Red Cross Society as well as MUHS. Library: The Library comprises of separate Reading Rooms for Journal Section and other books. There are facilities for Internet browsing too. Labs: There are laboratories for Anatomy as well as excellent labs for Nutrition and also Fundamentals of Nursing. There are 15 full time faculty in the college. This includes a few professors, lecturers and clinical instructors / tutors. The faculty are excellent teachers. Other than providing adequate coaching, they also teach soft skills to the students. Quality Clinical experience at various reputed hospitals. 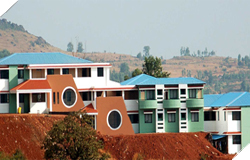 The hostel facility is available to candidates who desire to stay there. Hostel is not compulsory for students. There are only 25 seats for girls and 5 for boys. So, hostel accommodation is provided to those who ask for it first. Bel-Air College of nursing is located in a very scenic place. It is one of the few nursing colleges that are surrounded by natural beauty. The location of Bel-Air College of nursing is 250 kilometers from Mumbai and 100 kilometers from Pune. It is located in the evergreen hills and provides a quiet getaway for parents who would like to visit their children in the college of nursing. Bel-Air has a very attractive placement scheme. Graduates are usually placed in some reputed hospital in India like the Breach Candy Hospital. They are also placed in Bel-Air hospital, Bel-Air College of nursing and also in other reputed hospitals around the country. RANMs who graduate from this institution are placed with the NRHM programme with a reasonable pay. this article covers all the inforamtion about Bel-Air College of nursing. It is a one stop destination for you to know more about this college. If you need any more information, you can write to us with your queries.